Call Mack Hauling for all your junk removal needs. Serving Washington DC and Northern Virginia. Schedule your pick up by calling us or complete our FREE ESTIMATE request. We will get back to you promptly. We Get Rid of Junk! Ready to serve residents and businesses in the Dupont Circle & Logan Circle area of Washington DC. Tenant clean out services available to apartment complexes like Dupont Circle Apartments, The Flats at Dupont Circle, Gables Dupont Circle, Corcoran House, Sedgwick, The Drake, Dupont Apts., Bristol House, West Park, Shelburne, Baystate, The Preston, The Hamilton House and more. Homes and businesses near parks like Stead Park, Meridian Hill Park, Walter Pierce Park, and Mitchell Park. In Logan Circle the apartment complexes include The Gatsby, Latrobe Apts., Post Massachusetts Ave, The Newport West, The Palisades, Holm, Windsor, Andover House, The Eddystone, The Seville Apts., The Belvedere, The Mondrian, Sutton Plaza, JC Corporate Rentals, Miramar Apts. and all others. Areas such as Shaw- Howard, U Street Music Hall, The Howard Theatre, and more. We work with Churches and schools as well. We travel regularly down roads including R Street, Connecticut Ave., Massachusetts Ave., 16th Street, 14th Street, Rock Creek Parkway, Waterside Drive, Columbia Road, Rhode Island Ave., U Street, Florida Ave., Georgia Ave., 6th Street, 11th Street, Corcoran St.
Real estate agents preparing to list REO houses for banks/mortgage companies. Real estate agents advising clients to remove junk prior to placing their homes on the market. Property management companies handling rental properties for landlords. Local banks listing properties for sale. Landlords needing to clean out vacated properties. Contractors tired of spending high dollar on workers and dumpsters? Clean up and removal of excess items after a business has relocated or gone out of business. Builders needing construction debris removed. Apartment complexes needing to clean out apartments prior to leasing to new tenants. Mack Hauling welcomes any business who can utilize our service! Mack Hauling’s mission is to create a long-term relationship with your business or company! Yard debris been sitting in your yard for weeks? Tired of renting expensive dumpsters? Tired of all the unused items in your garage, basement or attic? Left over items from your yard sale. Have an Estate with items you want to sell, donate, recycle, or throw away? Get rid of that old piece of furniture or appliance that has been taking up space. Disabled or elderly unable to remove unwanted items from your home or property. 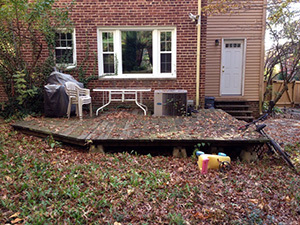 Demolition or removal of decks, satellites, sheds, pools, hot tubs, or whatever you need removed. Are you moving and have left over items to get rid of? Almost anything you can think of Mack Hauling can remove!